Area: The same citrine villa that El Patio's in -- that gated, tree-lined spot at the junction of Fenyang and Taiyuan Lu, with Paulaner and Colabo right around the corner, and the grown-up side of Yongkang Lu (Hungry Lung's Kitchen, Planet Kebab, Habibi Cafe) around the opposite bend. Follow Fenyang down a couple of blocks and there's that belt of foreign restaurants -- Goga, The Camel, La Creperie, Abbey Road, et al -- that combines to effectively Bermuda Triangle you right out of China. What it is: The casual companion to El Patio's fine dining concept, El Piso -- "The Floor" in Spanish -- is meant to resemble the kind of everyday, traditional tapas bar that people in Spain frequent. Nothing too fancy -- just reliably good food in a relaxed setting. Both restaurants are run by the same team: chef Pol Garcia's still at the helm, as he has been for the past two and a half years. He alternates between the two kitchens, and has a baby-faced Spanish chef to cover the Piso kitchen when he's downstairs. The space is managed by Matthew Ona, former F&B Director at Shook! and the Swatch Art Peace Hotel. 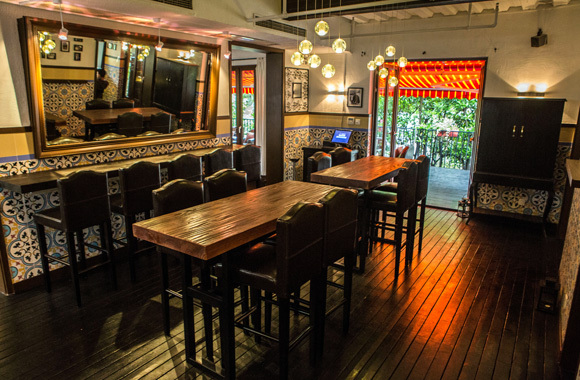 Ferran and Alberto, co-owners of the original El Patio, are conspicuously absent from this project, though their Hong Kong partners are still looking after the venue. 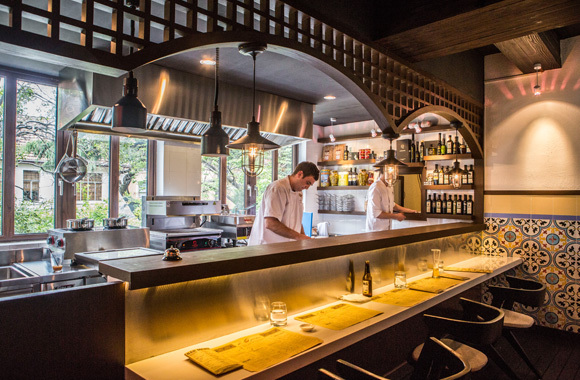 Garcia's menu spans all of Spain, with a small bias towards the seafood of his native Basque Country. The dishes are simple, casual eats so common and well-loved that they've become emblematic of Spain's many regional cuisines: bombas de la Barceloneta, salmorejo (garlic and vinegar-infused tomato puree), txipirones (baby squid cooked in their ink), pepito de ternera (beef, manchego and green peppers sandwiched between tomato toast). Nearly a third of the menu consists of ready-to-eat foods produced in Spain: Manzanilla olives, lightly fried Marcona almonds, small preserved sardines and mejilllones en Escabeche (mussels pickled in a paprika vinaigrette). The last two are canned goods from Ramón Peña. They also use olive oils from brands like Dauro, Ego Sum and Aubocassa. El Piso's proprietors talk about these ingredients with the satisfaction of a successful stage mom, all beaming eyes and irrepressible smiles. Super premium stuff, they say. The rest of the menu -- soups, salads, sandwiches and tapas -- features a lot of those aforementioned Spanish classics, though Garcia has tweaked a number of them to color traditional recipes with his own flourishes. El Piso's ajoblanco, for instance, takes the cold almond-based soup typical of Málaga and Granada, and spikes it with a touch of coconut, pineapple and rum. One of his sandwiches even starts moving towards fusion: El Asiatico, with Martini Rosso-marinated teriyaki chicken, sweet chili sauce and arugula. There's also "ku wak", a rice dish that Garcia says is often found in Chinese restaurants throughout Spain. The way he describes it -- it sounds something like a paella wannabe cooked up to cater to both Chinese and Spanish palates. Garcia's version features crispy puffed rice, which is drizzled with paella juices and presented on a sizzling platter. 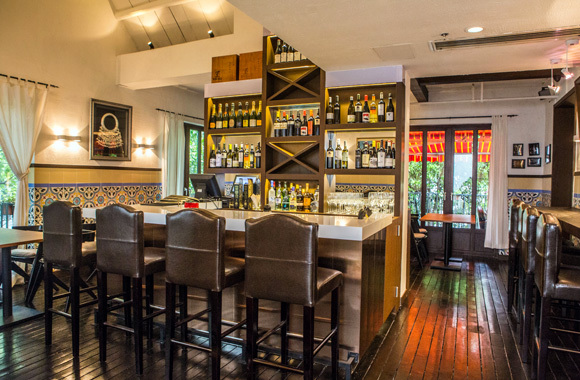 Atmosphere: Laid-back -- especially compared to El Patio downstairs. The place feels homey, with plush leather sofas, blue and white Spanish tiles, and more high top tables to imitate the feel of eating at a kitchen counter. Chefs prepare the dishes in a partially enclosed area at the back. This part of the restaurant has a bar that only seats five, creating what Ona calls a "Spanish omakase" dining experience. 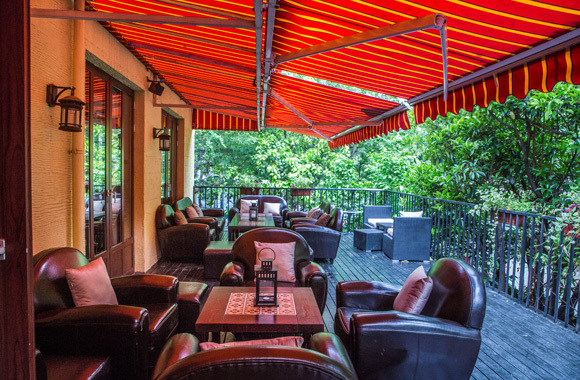 There's also that great outdoor terrace surrounded by trees. That area seats roughly 30 people. Apparently the idea is that the whole building gets more and more intimate as you move upwards. So you've got fancy El Patio on the ground floor, then casual tapas bar El Piso, and finally, a small whiskey bar tentatively called "Tree Lounge". It only seats a maximum of 25 people. Ona tells us that's still a work in progress, but that they plan to carry many international varieties of whiskey for its whiskey-based menu. Damage: Menu items range from 28-160rmb, with a majority of dishes in the 70-90rmb range. 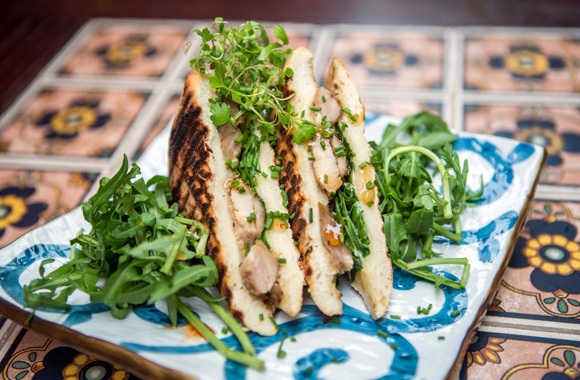 If you fill up on a sandwich, then you could probably walk out comfortably full at 100-150rmb per person. Expect the bill to double if seafood or premium items get involved. Who's Going: The second floor had its official opening just yesterday, but it's been sort-of, not-really, kind-of open for the better part of a month. Plenty of El Patio's regulars, not to mention the staff's Spanish friends living in the city, have already wandered upstairs to give El Piso a try by now.